It doesn't happen too often that dogs from the same breeder are going BACK TO BACK at a TOP show such as the Dutch Show ' Winner ' Amsterdam. For this reason we are proud of Liam (BOB) and Sara Lee (BOS) and our congratulations go to the owners of Liam Mr. Henk Meijer and Yvonne Agelink, especially since Liam was also appointed 2nd. place in the FCI Sporting Group VII. With this Group result Liam is also eligible to participate at the Dutch ‘Onze Hond van het Jaar Show 2013’ (freely translated: The Yearly Show: Best Dutch dogs 2012). Chapeau! 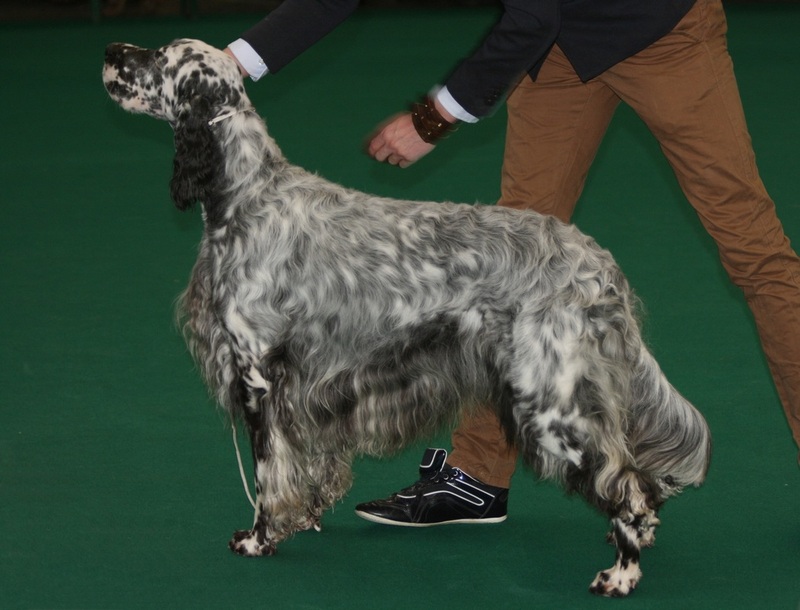 Both dogs acquired the Title ' Winner 2012 ' and got the double CAC/IB points making Liam with this result also a Dutch Champion. Sara Lee has now won the Title twice as she did before in 2010, not attending this show in 2011. By winning the Title ' Winner ' our Sara Lee and Liam have earned their admission qualification tickets for the Crufts show 2013. 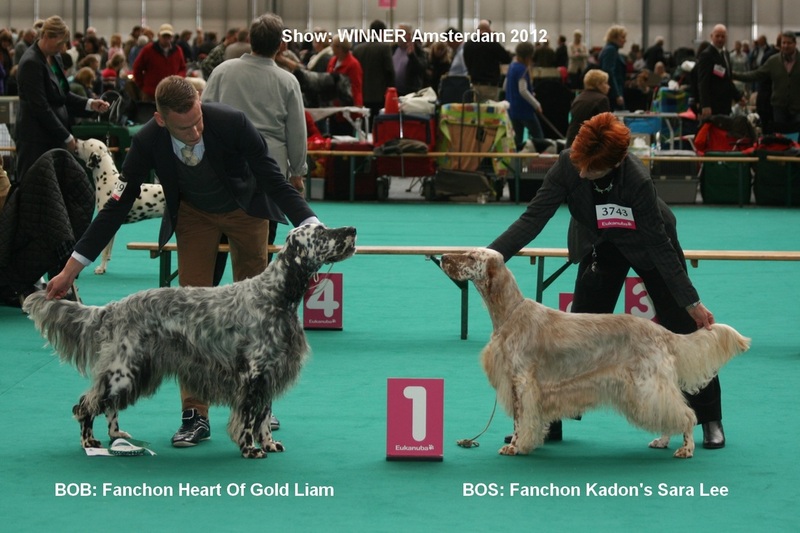 We, at Fanchon, although showing our dogs very limited in The Netherlands now look back - after this last Amsterdam Show for us in year 2012 (NL) - at wonderful and excellent results gained by our dogs as well by Fanchon bred dogs owned by others. Result and qualification Fanchon Paints It Black Jack: Very Good. 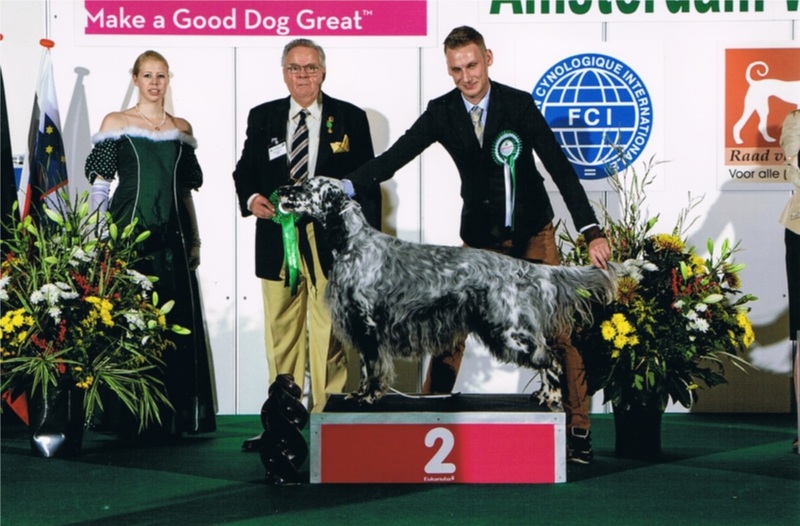 Out of the 18 shows available in The Netherlands we and owners of Fanchon dogs participated at 8 shows. 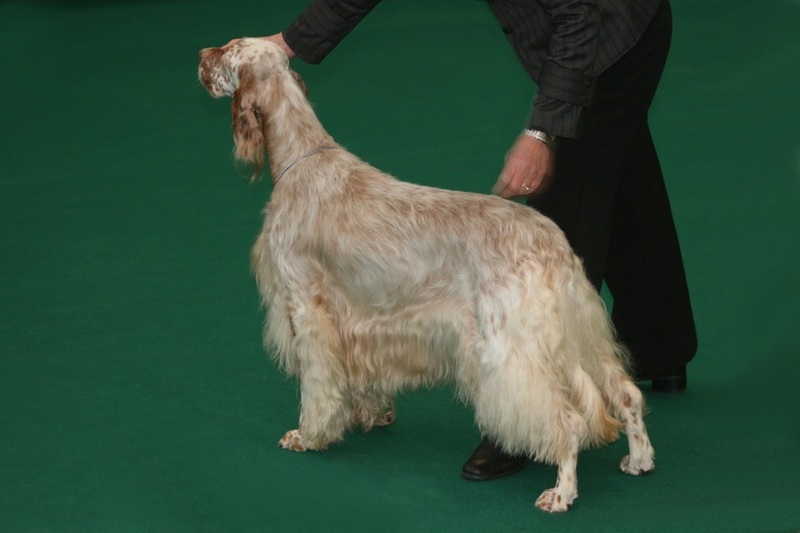 At 7 of these shows Fanchon dogs where appointed as being; Best Of Breed. Fanchon Kadons Candy Man Can: 3 BOB's, 3 CAC/IB's, 1 res. 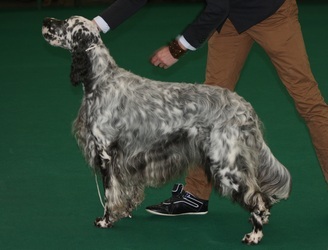 CACIB and Title: Dutch Champion. Fanchon Paints It Black Jack: 2 BOB's, 2 CAC/IB's, 2 res. CAC/IB's, FCI GROUP VII, 2nd. place. Fanchon Heart Of Gold Liam: 2 BOB's, 2 CAC/IB's, 2 res. CAC/IB, FCI GROUP VII, 2nd. place, Title: Winner 2012 and Title: Dutch Champion. Fanchon Kadon's Sara Lee: 1 CAC/IB and Title: Winner 2012. Fanchon You Have Got What It Takes: 1 res. CAC. Thank You All for showing our dogs in The Netherlands and abroad! Below some pictures that are taken at the Winner show.